Pack light! 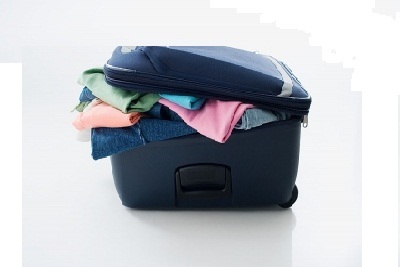 Bring only what you need and you won’t find yourself lugging your weight in clothing or sitting on your suitcase to get it closed. Go with what you know! One way to make sure you pack light is to bring outfits you’ve warn before that you know fit well and that you feel comfortable in. Why bring “options” when you’re probably only going to end up wearing your tried-and-true favorites anyway? Think with your feet! Men are already doing this – and it’s time us ladies caught on. Find one (or two at the most) pair of shoes that jibe well with a lot of your wardrobe and that are comfortable. Nothing takes up more useless space than several pairs of shoes, and when half of those shoes hurt your feet and only match with one outfit, you’ll be wishing you brought those practical pumps you usually wear. Think about what you’ll be bringing on the plane with you, and what you’ll want to have access to. Will you be using a laptop? A book? Are you bringing toiletries? Be sure to pack anything that you will want to access while on the plane or in security in an easy-to-reach location. I personally put my toiletries in the front most pocket of my carry-on suitcase with nothing else on top of it so I can easily reach in and grab it, and have my laptop unburied in my tote. Do you have a specific type or brand you could recommend for carry-on suitcases? It seems like our American carry-on bag is often too big for the overhead on European planes. Well, even though my personal carry-on bag isn’t this brand, I highly recommend TUMI. They’re a bit expensive, but come with a five-year warranty and will be replaced if anything gets broken or damaged. They have a line of carry-on bags that are really great (I will be getting one as soon as I can! ), and they even specify which are “international” so the sizing works on European planes. I would also add that you should roll your clothes. It takes up less space and your clothes dont get as wrinkled. Put socks in your shoes to save space.